What is STEM? 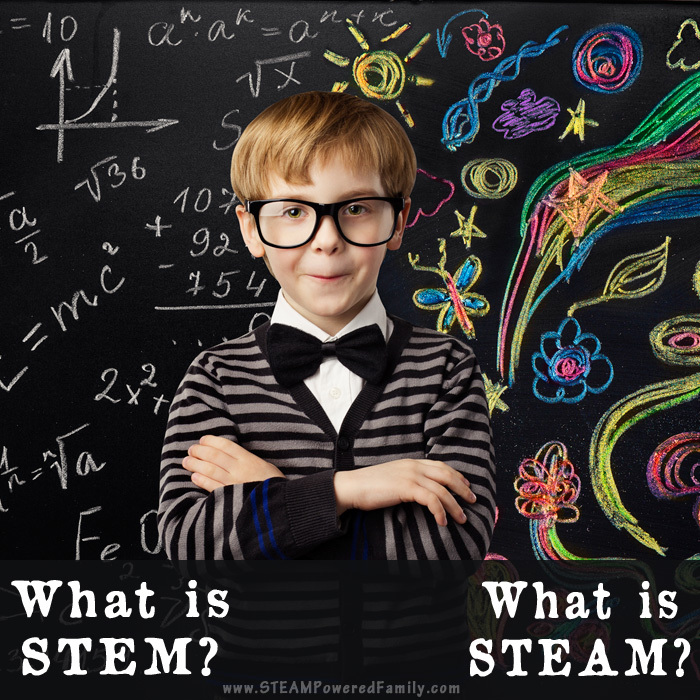 What is the difference between STEM and STEAM? Perhaps you’ve seen the terms before, or maybe STEM is brand new to you. STEM is not, new, but it is gaining a lot of attention in recent years as educators look for more effective and meaningful ways to connect with and engage students. At it’s most basic, STEM stands for Science, Technology, Engineering and Math. Alternatively, STEAM stands for Science, Technology, Engineering, Arts and Math. But STEM education is far more than just sticking those subject titles together. It’s a philosophy of education that embraces teaching skills and subjects in an a way that resembles real life. How is STEM Education Important? The key component of STEM and STEAM is integration. Instead of teaching disciplines in independent subject silos, lessons are well rounded, project and inquiry based, with a focus on interdisciplinary learning. STEM and STEAM align with the way we work and problem solve in our daily lives. Making it an exceptional way of instructing and learning. With STEM we are teaching skills the way they will be used in the workforce, and the real world. Rarely does a job require only one skill set like math. Picture an architect, they use science, math, engineering and technology to do their jobs. The subjects do not work on their own, instead they are woven together in practical and seamless ways allowing the architect to design complex buildings. STEM and STEAM are not new, they are simply ways of understanding and applying an integrated form of learning that resembles real life. Instead of teaching math as separate from science, they can be taught together in a way that shows how the knowledge from those two fields compliment and support each other. Why add the A in STEAM? The addition of Arts to STEM to create STEAM is about incorporating creative thinking and applied arts in real situations. Art isn’t just about working in a studio. Art is about discovering and creating ingenious ways of problem solving, integrating principles or presenting information. Picture an architect, they use engineering, math, technology, science and arts to create stunning buildings and structures. Many people feel that adding the A is unnecessary and that the application of creativity and arts is a natural part of STEM, but others like to highlight it. For elementary aged children, in particular, I like to include the A to ensure that facet of learning doesn’t get forgotten in our lessons. Whether you prefer STEM or STEAM the underlying principles and practices are very much the same, it’s about integration of the pillars: Science, Technology, Engineering, Arts and Math. How Will STEM Improve Student Learning? Simply put, STEM reflects real life. Jobs in the real world are interdisciplinary. We need to educate children in how subjects integrate and work together. They need to develop diverse skills sets and a passion for exploration and growth. We don’t need children to memorize random facts anymore. We have so many facts at our finger tips now. When I’m having a debate with someone, I can pull out my phone and in seconds have all the facts. Education is no longer about memorizing facts. Instead it is about learning how to think critically and evaluate information. How to apply knowledge, research and skills to problem solve. Skills need to be taught in an applied way, as part of a greater whole, rather than the traditional approach of individual subject silos. STEM embraces the 4 C’s identified as key in 21st Century education: Creativity, Collaboration, Critical Thinking, and Communication. Most importantly, by incorporating inquiry based principles and an highly adaptable framework to suit students of various needs, STEM helps to foster a love of learning. And the most important gift an education should give a student is a love of learning. What Are Some Problems With STEM Education? One of the biggest concerns I hear from people about STEM education is the lack of resources. Funding for the newest technology, training in how to use the new technology, plus the knowledge of how to use it effectively as a learning tool, are all areas where teachers struggle. Another area where a lot of teachers struggle is with a system that is focuses on assessment and grades rather than a program that fosters innovation, creativity, critical thinking skills and problem solving skills. These achievements are not something that can be easily boxed up and assessed. Sadly, another thing I hear a lot is that some teachers are simply not interested in learning how to teach STEM and STEAM. They prefer to stay in the silos. Keeping each of the stem subjects isolated into their own lessons. How To Get Your Kids Interested In STEM? STEM aligns so much with the way children’s minds learn and work from a very early age. The best way to foster a love of STEM is to encourage curiosity. From a young age encourage kids to question, to explore and to play. Find their passions and help them chase those passions. Even if it changes week to week, this is perfectly normal, especially for younger kids. Encourage it. You will be amazed where your kids can go when they become passionate about learning. From preschool to elementary to middle school and finally, high school, STEM and STEAM education will help children become innovative adults with exceptional critical thinking and problem solving skills. Skills that our future generations will need in our increasingly technology driven world. Grab A FREE STEAM Activity Pack! Kick start a love of STEAM with our free activity pack available from the STEAM Powered Family Shop. Both STEAM & STEM are an incomplete answer which are being sold as a complete package. Why do we limit the degree to which we integrate the study of technology? I am talking about the original concept of the word not the current fad. Technology is how humans change their environment to make their lives better. In order to understand the world of technology our children must get their hands into it. What is being sold now is the same difference between flower arranging and gardener/farmer. One takes already finished items and arranges them. The other actually makes or grows them from seeds or cuttings. The first is done in a bright clean setting the other requires dirt, fertilizer, and all the accoutrements of growing. For decades technology was provided in out schools. They included learning to work with wood, metal, plastic, electricity/electronics. As the students became more advanced so did the complexity of their technical course. They were filled with students on the engineering/science track. Since being dismantled we have fewer young people interested in engineering. Its simple to know why. Schools with strong phys ed/ and sports programs create life long interests. The same with music. The current STEM/STEAM programs need to be adjusted and include the basics not just assembling kits or working with paper and scissors. That’s too bad your experience with STEM and STEAM in schools has not been positive. You are right, there is far more to STEM than just assembling premade kits. That’s why here at STEAM Powered Family we explore a lot of projects working with raw materials including metal, electricity, plastic, wood and so much more. I encourage you to continue looking. There are far more options in STEM and STEAM for kids than simply assembling premade kits. how do i apply STEM and STEAM Education to my community, starting from Downtown Brooklyn and Continuing?